Meal planning doesn't have to be difficult or time consuming! Read on for 5 meal planning myths and find out why it's not as complicated as you think. It’s one of those things you know you should be doing, but that many of us end up avoiding. You know planning will help you eat well and feel good throughout the week, but still, it ends up on the dreaded chore list and often gets skipped. If you know the benefits of meal planning, but avoid it because it seems complicated, overwhelming, or downright unpleasant, know that you’re not alone. Maybe you feel pressure to cook new and original recipes each night of the week, or maybe the idea of sifting through thousands of recipes makes you want to run the other way. If this sounds like you, know that meal planning can actually be simple, seamless part of your weekly routine. There are so many meal planning myths out there, reinforcing the idea that it has to be arduous or complicated. Today I’m breaking down the myths, sharing why it’s not as complicated as you might think, and giving you a game-plan to streamline the process in your every day. 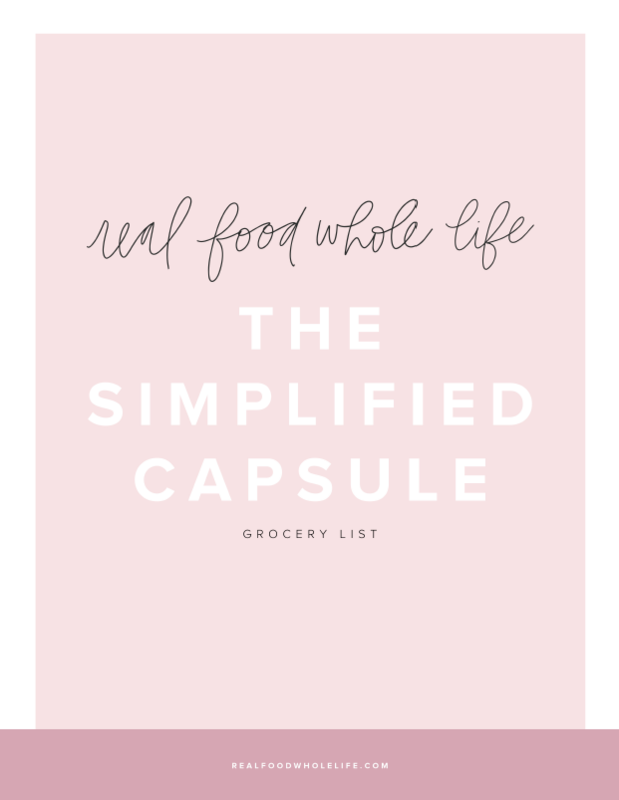 But first, grab your free simplified grocery list! Download your free Real Food Whole Life grocery list! In the past traditional meal planning has required sifting through dozens of recipes and creating a new plan each week. This method is not only time-consuming, but also impractical for weeknight cooking. It also makes grocery shopping tricky, since each recipe has a separate list of ingredients that may or may not work together after that particular recipe has been made. The Essential Six are the fundamental building blocks of any recipe: sauces, protein, cooked veggies, raw veggies, grains + bases, and toppings + extras. Thinking in terms of building blocks allows you to combine them into an infinite number different meals. Think bowls, tacos, pasta, salads, and stir-frys, just to name a few. Using the Essential Six method allows you to efficiently shop, plan and prep, without wasted time or money. As an added bonus, you can create a fridge and pantry filled with ingredients that actually go together, no matter what you’re cooking. Plus, thinking of meals in terms of the Essential Six allows you to efficiently prep just part of a meal, without cooking the entire meals ahead. One meal planning myth that many of us believe is that planning is complicated and must take hours to do. And, if you start from scratch with a pile of cookbooks and no process to guide you, planning cantake forever. The Simpler Way: Create a stress-free weekly meal map organized around meal types. Instead of setting out to create a complicated meal plan, think instead about creating a loose map to follow, with just enough structure to guide you. And, instead of planning for individual recipes, think about meal types such as tacos, pasta, bowls, stir-frys, and salads. Once you’ve decided on the meal types for the week, decide how you’re going to combine the Essential Six. Choose a sauce to use, then move through the list by selecting a protein, veggies, and so on. Do you ever find yourself wandering around the grocery store without a plan, grabbing whatever looks interesting, only to get home and not know what to do with what you bought? Or, do you bring home bags of groceries only to throw out the majority of food at the end of the week because you don’t know what to do with it? If you answered yes to either of these questions, you are not alone. Grocery shopping without a plan can be challenging, and can lead to frustration and disappointment. The Simpler Way: Streamline grocery shopping. Think about the Essential Six and meal types when you’re grocery shopping. Bonus points for outlining a meal map and using the meal map to create a quick grocery list before you go shopping. Many of us think of meal planning as a dreaded chore, right up there with laundry folding or bathroom cleaning. And who wants to spend their precious weekend hours on a dreaded chore? I know I don’t. The Simpler Way: Make prep an enjoyable part of your weekly routine. By thinking of meal planning in terms of the Essential Six and meal types, you’ll automatically make the process simpler and more streamlined. With practice, creating a meal map and grocery list can become an effortless part of your weekly routine. Schedule a time that works for you. Maybe it’s during your child’s afternoon nap, a lazy Sunday afternoon, or late at night when everyone’s in bed. Set aside a special time to plan in your favorite comfy spot. Create rituals around this time to make it something you look forward to. Play your favorite music or podcast and pour yourself a glass of wine or warm cup of tea. Celebrate the time invested by enjoying the food all week long. There is definitely a misconception out there that if you’re going to meal plan, it needs to be for the entire week. For most, planning seven days worth of meals is an impossible standard, and one that discourages many from even getting started. The Simpler Way: Anything is Better Than Nothing. If you’re new to meal planning, or have struggled with complicated systems in the past, try reducing the number of meals you map. Two or three is a great number to start with. Experiment with the number that works for you and that is actually sustainable in your weekly routine. A capsule pantry is similar to a capsule wardrobe: a limited number of items, carefully selected to be combined in a number of different ways. Many people who adopt a capsule wardrobe approach fall in love with the sense of ease and liberation it provides in getting dressed each day. By having fewer items, there are fewer decisions to make, and getting dressed in the morning becomes simple and streamlined. A capsule pantry follows the same philosophy: an intentional selection of pantry and fridge staples that can be mixed-and-matched to create an endless variety of meals. Do you have a simplify meal planning? Share your process below, and tag @realfoodwholelife on Instagram so I can see what you're up to! pin these meal planning tips for later!